Education Minister calls on opposition to show unity with government as riots and terror attacks continue. Jewish Home party chairman Naftali Bennett addressed the recent violence over the Temple Mount at the beginning of the weekly Jewish Home faction meeting Monday. 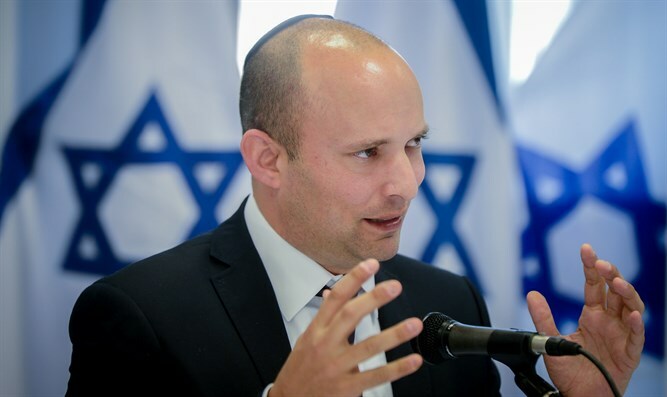 "The Government of Israel is acting responsibly, with unity and judgment in the face of a complex political and security situation," Bennett said. "Contrary to various claims, including from the opposition benches, the decisions are made in an orderly, balanced and responsible manner, and I fully support the prime minister, the Israel Police and all the security forces." "In general, during times of [severe] security challenges, we must work together to prevent a discourse of accusations, and therefore in the political and security discussions I made clear the need to make unanimous decisions and to have broad agreement in the cabinet, and I am happy that my colleagues in the cabinet adopted this position," Bennett added. "I am addressing the members of the opposition: This is an hour for unity and statehood," added Bennett. "The justice minister is working with me on the legal level to clarify to the world and to Jordan the full immunity of the Israeli diplomat and we are working on a series of additional channels to get our man back from Jordan." On Sunday, the Israeli embassy in Amman’s deputy security officer was stabbed at his residence in the embassy compound by a Jordanian man who had been brought to move furniture. After he was stabbed, the security officer opened fire, killing the terrorist. A second Jordanian citizen, who was described in various media reports as being either a doctor employed at the embassy or the owner of the residence, was also killed during the attack. Following the attack, Jordanian officials have demanded Israel turnover the security officer for interrogation – despite his diplomatic immunity.